NEW DELHI, India (CNN) -- The fifth and final phase of India's marathon general election to choose a federal government ended Wednesday. 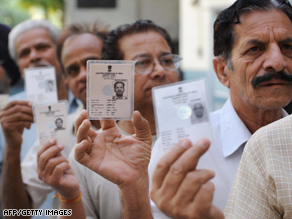 Indians voters hold up their voter ID cards at a polling station in northern India. Home to about 714 million voters, India is now due to hold a single-day vote count Saturday for 543 seats in the lower house of its parliament. India's election commission spokesman Rajesh Malhotra told CNN that a 62 percent voter turnout was recorded in the last phase of polling Wednesday. Voting in the month-long exercise was spread across 28 states and seven federal territories. Stock markets closed 138.4 points down -- as voting drew to a close Wednesday -- apparently over fears of political uncertainty ahead. Over the years, regional parties have emerged as key players in government formation in India, creating a situation in which federal power is now shared by a coalition of groups. Last year, Singh's Congress party lost the support of the communists, who opposed India's civilian nuclear cooperation agreement with the United States. The party was able to survive primarily with the backing of a powerful regional party.